In the following essay, I explore each of the three species and national parks that serve as the focus of Refuge and relate how I’ve approached telling their stories through music. Kemp’s Ridley Sea Turtle Hatchling. Photograph © 2009 Terry Ross. Made available under a CC BY-SA 2.0 license. Source. This first movement of Refuge depicts the life cycle of the world’s most endangered sea turtle, the Kemp’s ridley, and the species’ intimate connection to Padre Island National Seashore. The narrative of “Imprint” is divided into three parts: Birth, Journey, and Return. Lush arpeggios and sustained notes establish the atmosphere of Padre Island’s beach at sunrise, the time when Kemp’s ridley turtles typically hatch. A syncopated 7/8 groove evokes the tiny hatchlings’ release onto the sand, their charmingly awkward race to the ocean’s edge, and their entry into the surf. The listener is carried off with the tide, following a female turtle that has been separated from the group. Sweeping, gently propulsive “time-lapse” music depicts the turtle’s journey up along the Atlantic coast, foraging and growing to maturity over the course of a decade. Finally, she feels the call to return to Padre Island—represented by the reprisal and transformation of the “hatchling release” and “sunrise” music, which were heard at the beginning of the piece—to lay her eggs and start the cycle over again. Staff from the Division of Sea Turtle Science and Recovery at Padre Island National Seashore excavate eggs from a sea turtle nest. The eggs will be relocated to a protected area. NPS Photo. I conceptualized “Imprint” as a response to the work of the Division of Sea Turtle Science and Recovery at Padre Island National Seashore in Texas: the only division of its kind in the National Park system. Currently classified as Critically Endangered, the Kemp’s ridley sea turtle was brought back from the brink of extinction through a multi-agency effort in the late 1970s. 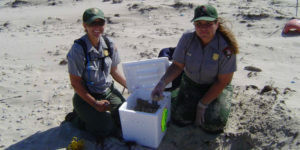 This species’ rehabilitation continues to depend in part on the NPS’s conservation work at Padre Island. Kemp’s ridley hatchlings imprint to their natal beach—and after ten to twelve years, once they have reached maturity, females return to that very same beach to nest. The NPS has helped to rehabilitate the Kemp’s ridley by establishing a secondary nesting colony at Padre Island. This experimental effort involved relocating eggs originally laid at the species’ primary nesting site at Rancho Nuevo in Mexico. Today, the NPS manually collects each of the eggs that have been laid at Padre Island, protecting the eggs from myriad hazards, overseeing their incubation, and then releasing the hatchlings one by one onto a protected beach (a spectacle that is open to public observation). My interest in composing a piece about the Kemp’s ridley sea turtle was first sparked by an experience I had a couple of years ago. One November day, while walking at Elizabeth A. Morton Wildlife Refuge in Sag Harbor, NY, my family and I encountered a “cold stunned” sea turtle stranded on the beach. We alerted the Riverhead Foundation for Marine Research and Preservation and were able to help rescue the turtle for rehabilitation by carrying it back to the trailhead. This turtle was one of many that had washed up on local beaches that season, immobilized by a hypothermic reaction to the chill in the water. When I learned that these majestic creatures swimming in the bays of Long Island had traveled all the way from the Gulf of Mexico, where they would ultimately return upon reaching maturity, I was fascinated by the way in which geography was so deeply intertwined with their biology. 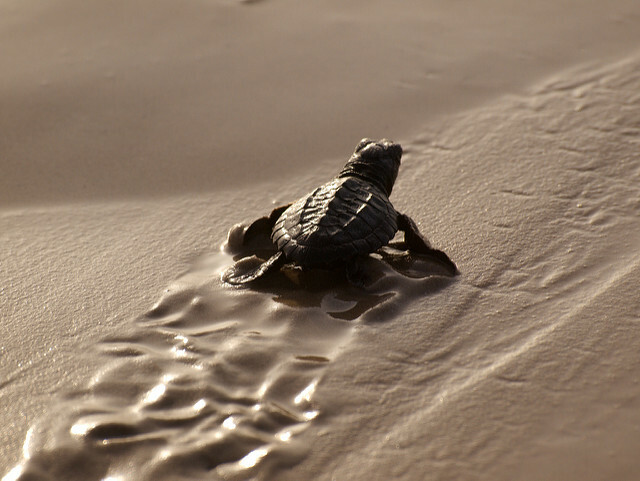 The Kemp’s ridley sea turtle demonstrates how the impact of the National Park Service reaches far beyond the boundaries of NPS-protected areas such as Padre Island National Seashore. Learn more about Kemp’s ridley sea turtle conservation from Padre Island National Seashore. 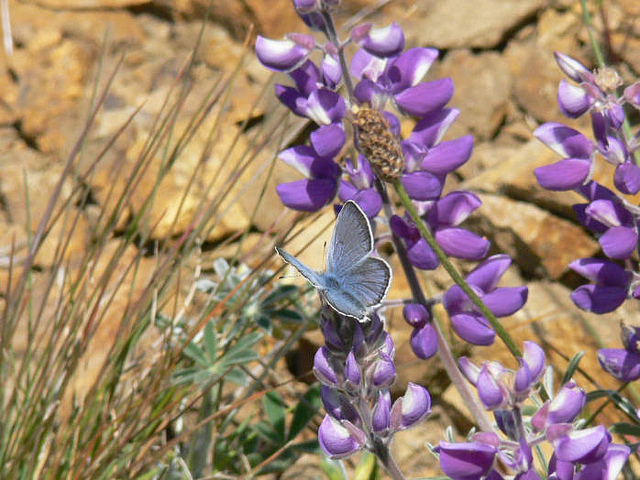 Mission Blue Butterfly on Silver Lupine. Photograph © 2010 Patrick Kobernus. Made available under a CC BY 2.0 license. Source. The endangered Mission blue butterfly lives exclusively in the coastal grasslands of the San Francisco Bay Area. Within this habitat, the Mission blue is entirely dependent on three species of lupine plants, which sport spring flowers ranging from deep purple to white, for its life cycle. There are presently a handful of “islands” of this type of habitat remaining in the Bay Area that support Mission blue butterfly populations, encompassing both private and public land. The National Park Service, U.S. Fish and Wildlife Service, Golden Gate National Parks Conservancy, and San Francisco Recreation & Parks Department have all worked to set this species on its current path towards recovery. 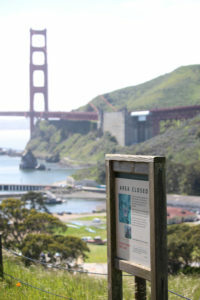 “Area Closed” sign alerts visitors to the presence of Mission blue butterfly habitat in the Marin Headlands at Golden Gate. Photo © 2016 Nell Shaw Cohen. One of the key locations for Mission blue conservation is in the Marin Headlands of the Golden Gate National Recreation Area. As a former San Franciscan who frequently visits the area, I have spent countless hours walking the stunningly beautiful coastal trails of the Marin Headlands. In recent years, I encountered a particularly intriguing spot in the hills just above Fort Baker: a historic military fort nestled below the Golden Gate Bridge, which is now host to a luxury hotel, a children’s museum, and a marina. Threatened by invasive species historically planted by the Army, such as eucalyptus and cypress, a few little patches of Mission blue habitat are protected by ropes and signs alerting visitors to the presence of these precious butterflies—about the size of a quarter, during their fleeting, week-long adulthood. “In the Lupine Hills,” the short, fast-tempo middle movement of Refuge, is a portrait of this place. Sweeping and oscillating piccolo, vibraphone, and high violin evoke the delicate “micro” world of the butterfly: lupine flowers and grasses trembling in the breeze, nestled within urban development. The “macro” world of its surroundings—the Marin Headlands, the Golden Gate Bridge, and the city of San Francisco—appears near the end of the movement in a slower tempo with a rising melody, which is traded in turn between each of the instruments. Learn more about Mission blue butterfly conservation from the Golden Gate National Parks Conservancy. Bison in Yellowstone. Photo © 2009 Ethan R. Made available under CC BY-ND 2.0 license. Source. Appearing on the official arrowhead emblem of the National Park Service and the seal of the Department of the Interior, the American bison (commonly known as buffalo) is this country’s symbol for conservation and national parks. Designated earlier this year as the first national mammal of the United States, bison also have an iconic cultural importance for America, rooted in their centrality to indigenous peoples and their role in early pioneer culture. Bison have one of the most successful and controversial narratives of wildlife conservation, steeped in a history of tensions between violence and protection, oppression and collaboration, loss and triumph, and private and public interests. Through the story of bison in Yellowstone National Park, we find many of the fundamental thematic threads of the American experience. Indigenous tribes in the Yellowstone area were once dependent on bison for their “food, clothing, fuel, tools, shelter, and spiritual value,”1Yellowstone Bison: Conserving an American Icon in Modern Society, available at http://www.nps.gov/yell/learn/nature/bisonrefs.htm with bison occupying the Great Plains in numbers estimated at 25-30 million. Early pioneers also utilized bison trails, dung, meat, and hides for their survival. With westward expansion, the government became aware of the Great Plains tribes dependence on bison—and so the U.S. Army systematically decimated bison populations in order to weaken the indigenous population of the land they sought to control. Photograph from the mid-1870s of a pile of American bison skulls waiting to be ground for fertilizer. Source. 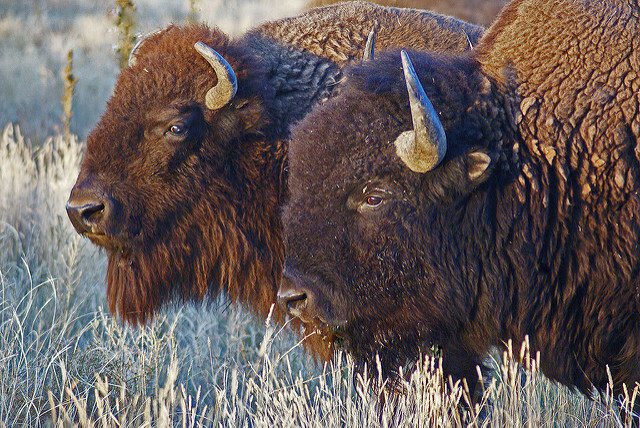 Public support for the conservation and rehabilitation of bison followed these tragic events. Ironically, it was the U.S. Army itself (which administered Yellowstone National Park before the creation of the National Park Service) that, empowered by the Lacey Act of 1894, protected Yellowstone’s bison from hunters. By 1902, there were only about two-dozen animals left within Yellowstone’s herd: the largest remaining wild population of plains bison south of Canada.2Ibid. A major cooperative conservation effort took place over the coming decades, which involved the introduction of animals from other, smaller herds into Yellowstone’s population. Today, there are an average of 4,000 bison in the park: making Yellowstone bison a great triumph in the history of wildlife conservation. Yellowstone’s bison are the subject of ongoing controversy, however, necessitating intensive management and population suppression. During winter, bison migrate to lower elevation areas that lay outside the boundaries of the park. Private landowners and the surrounding states have limited tolerance for their presence, due to competition with humans for land use and concerns about the perceived possibility of brucellosis, a (non-native) disease carried by some wild bison, spreading to cattle. 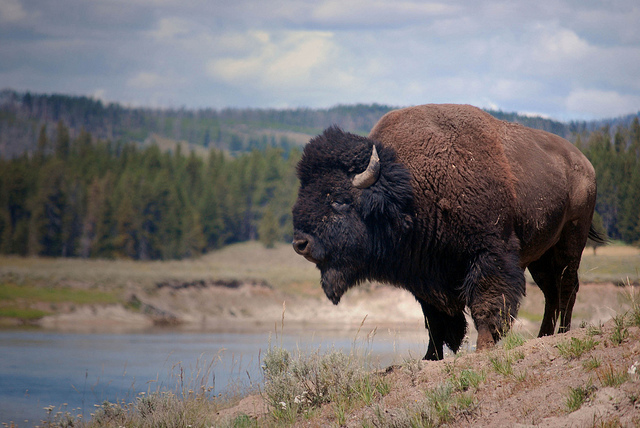 The Interagency Bison Management Plan, which includes both governmental and tribal partners, oversees bison management across park and state boundaries. Current practices call for the selective capture and/or slaughter of animals that leave park boundaries—sometimes several hundreds of animals are slaughtered in one season. Those bison are then provided to native tribes for their use. In the third and final movement of Refuge, “Where the Buffalo Roam,” I have sought to create a highly condensed musical narrative depicting moments from the history of bison in Yellowstone National Park. This piece is built around a quotation from the nostalgic pioneer song, “Home On the Range” (“Oh, give me a home where the Buffalo roam”), which was written in the 1870s by Brewster Higley and popularized by Bing Crosby and Gene Autry, among others. Through my piece, I transform a snippet of this sentimental tune through three sections to evoke glimpses of the bison’s history. 1939 recording of “Home on the Range” from The Library of Congress. Source. In the first section, Wild, I utilize glassy “sul tasto” strings and a quiet, gently rhythmic texture to envision bison in its prehistoric state: balanced, roaming free, hunted and venerated by the Great Plains tribes. The arrival of homesick pioneers (heralded by woodblocks in the percussion) soon gives way to Hunted: fast, tambourine-driven runs indicating the mass hunting of bison by pioneer men and the U.S. Army. The near-extinction of the bison is conveyed by a sudden thinning of texture to a series of soft, eerie chords. Out of this nadir builds Renewed, culminating in a final, full expression of the “Home In the Range” melody. This ending suggests a hopeful vision for bison’s flourishing today in Yellowstone and a future in which we might someday live in balance with wild nature. To learn more, I recommend visiting National Park Service’s page on bison in Yellowstone, as well as the excellent in-depth study Yellowstone Bison: Conserving an American Icon in Modern Society, which is available as a free download. UPDATE: Watch the full-length video of Cadillac Moon Ensemble’s World Premiere performance of Nell Shaw Cohen’s Refuge. This entry was posted in essays and tagged concerts & events, indigenous cultures, National Parks, original video, wildlife conservation by Nell Shaw Cohen. Bookmark the permalink. The bison’s continuing story is fascinating and inspiring – especially after just spending time with bison up close and personal in Yellowstone! Really looking forward to this piece! Hi there! I’m writing to talk about composer’s intent. Clearly, Ms. Cohen has plenty of it in her writing style with Refuge. The gorgeous musical lines are evocative of emotion, but what prescribes the emotions and ideas that Cohen expresses? Elsewhere on the Landscape Music website Cohen talks about the human understanding of music, and how we as a community shape what the music truly means. What prevents an audience member from simply saying, “no, refuge is about the American people traveling and evolving and struggling” instead of it being about the Kemp’s Ridley Sea Turtle or American Bison? Isn’t this the beauty of music, that the prescribed understanding of it is that there can’t be one? As a website, I haven’t seen Landscape Music decide whether or not the composer’s intent rules all, or if the audience and culture surrounding the music gets to decide what it is truly about, and I’d love to know what some of the composers in the Composer’s Network have to say about that. I love the work of Landscape Music, but don’t think I quite understand how the music that is being written and discussed here can change the mindset, the “massive paradigm shift” of the world that is pointed out as necessary by Cohen without the public’s ability to comment and discuss on what they can prescribe to be the meaning of the music. The very explicit description of specific definitions of Refuge and its movements makes me feel like Cohen is the only deciding factor.